Before reviewing “Food & Drink Infographics,” I must make a disclosure: I designed one of the graphics featured inside. Created originally for an Oregon Wine Press article titled “Making Scents of Wine” in November 2011, the graphic-turned-poster acts as an aid in moving descriptors off the tip of the tongue and into tasting notes. So, I'll admit I was excited when this title finally became available, as of Aug. 8. The following is my truly unbiased review. 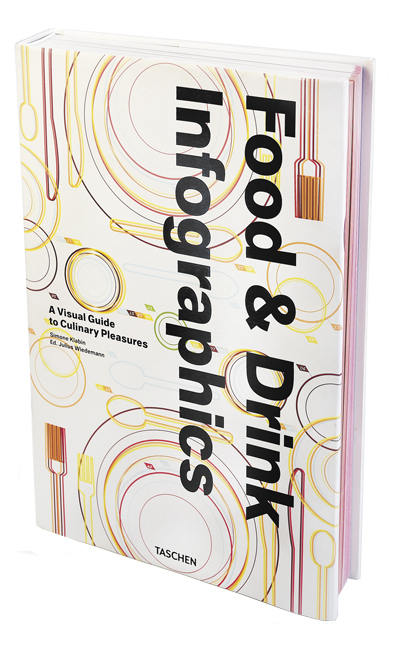 From Taschen, one of the most-respected art book publishers in the world, “Food & Drink Infographics: A Visual Guide to Culinary Pleasures,” is an 8.5-pound behemoth of culinary curiosities by author Simone Klabin. Across the 480 pages, you’ll find a feast for the eyes and brain. The New York City writer’s compendium of graphics is chock-full of facts, fascinating and practical. Want to know the amazing multi-million-year history of processed foods? Turn to page 35. What would a periodic table of proteins look like? Flip to 52. How about a one-page encyclopedia of pasta? Find it on 165. In addition, a cartography of kitchenware (page 302); the alchemist’s guide to alcoholic beverages (359); and a wine map of South Africa (436) are just a few of the hundreds of visuals you’ll enjoy. While some of the graphics present a challenge to read — as in the original art is a large print meant for framing — Klabin would be remiss to ignore these comprehensive pieces. Loaded like a baked potato, these particular graphics offer so much information a magnifying glass may be helpful. Klabin and editor Julius Wiedemann ease some of the scaling challenges by spreading the art over adjoining pages; some even unfold. A mixture of old and contemporary art, the book offers a veritable smorgasbord of styles, both traditional media — painting and illustration — and computer graphics. The descriptions in English, German and French attribute, date and explain each infographic, plus a bit about the subject matter from Klabin. Data made visual is not a new concept, as the author explains in the front of the book using a history lesson. From Egyptian hieroglyphics for flatbread to 19th-century classics such as “Mrs. Beeton’s Book of Household Management,” we humans have used pictures for communicating our love of food and drink for eons. If you’re a fan of graphic design, buy it. If you’re a foodie, find it. If you’re looking for useful reference charts in all things culinary, get it. If you are all of the above AND want to beef up your arm muscles, then there’s no excuse. Without a doubt, the book’s girth will be your first impression — as it was mine. But it’s what’s inside that counts and this one is intriguing. For visual learners, like me, there’s even a good chance some of the information will stick — like spaghetti to a ceiling. Meals are best when shared; the same theory includes books. Whether hosting friends for a weeknight feast or passing on a copy of your favorite novel, the compulsion to do it again comes from establishing real life connections, building relationships. This sense of community is what “Wine Food: New Adventures in Drinking and Cooking” is all about. Friends Dana Frank and Andrea Slonecker created the book one recipe at a time, often preparing and serving the working dishes to family and friends. The wines chosen also followed an organic process with help, at times, from lucky guests and significant others, taking notes of the wines’ nuances and how they interacted with the flavors of the food. Bold, artful photos capture these gatherings. From my estimation, a sincerely good time was had by all, especially the authors. Frank is the co-owner of Bow & Arrow, a Portland winery and wine distributor, and the recently opened wine-centric Bar Norman in Portland. As a sommelier, she’s overseen programs for notable Portland restaurants, including Ava Gene’s. Her wine list savvy has earned her accolades from Food & Wine and Bon Appetit magazines. Slonecker is the author of six cookbooks, including “The Picnic,” the winner of an International Association of Culinary Professionals Award in 2016. An in-demand food stylist and culinary teacher, she is a force in the Portland food scene — and this month’s personality in OWP’s Last Call Q&A. Throughout the book, their individual talents are on full display. From the beginning, Frank’s command of wine is evident with basics and general tips illustrated and explained. She pairs each dish with a specific variety and, many times, with an individual region, alongside a commentary on the wine and note about the dish. 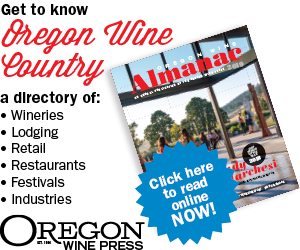 Frank also includes a short list of specific producers — if it’s from Oregon, it’s likely a Portland winemaker. 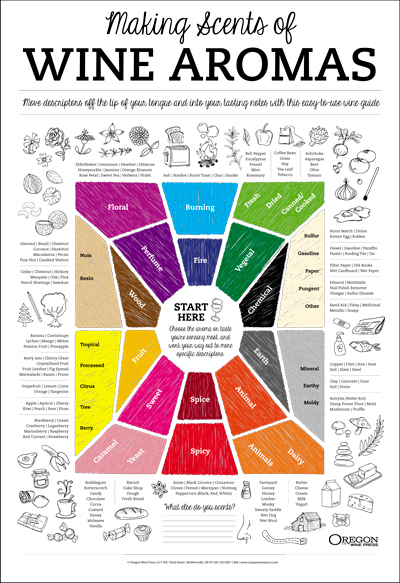 The wonderfully colorful “Pairing Cheat Sheets” add another layer of wine wisdom useful beyond the recipes featured. The quirkily named chapters — Prefunk (appetizers); Brunch with Benefits; Salad Days; The Big Veg; Picnics and Other Reasons to Eat Outside; Uncommon Common Dishes; Cozy Night In — future a number of recipes. Each chapter ends with a meal pulling dishes from throughout the book. The mouthwatering plates, representing cuisines from around the world, seem simple enough to make with well-explained directions even this lousy chef could follow. The dishes and choice of wines feel fresh and eclectic, for sure. But, for me, the photography is where it shines. The talented Eva Kolenko’s imagery is stunning, making you want to scoop a helping of whatever graces the page. The lighting is just right and Slonecker’s talent at styling shows. In many of the photos, you’ll notice a hand or two, appropriate for the clearly hands-on feel of the entire project. They’ve had their hands busy in the cellar, too, releasing a blend of Pinot Noir (70 percent) and Gamay Noir (30) to be released in September at the same time as the book. The name? Food Wine. Simple. To the point. 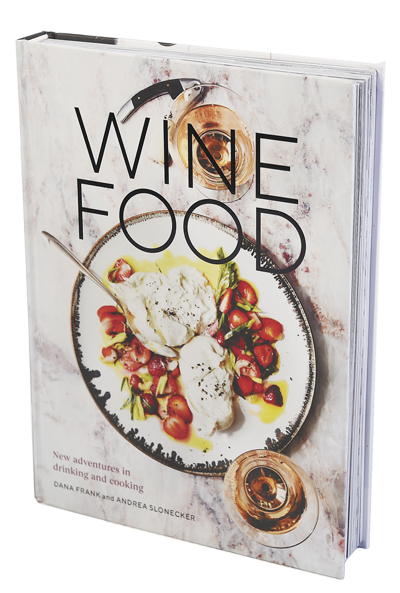 And it’s a tiny production; only 25 were produced with the help of the authors’ winemaking significant others: Scott Frank of Bow & Arrow and Tom Monroe of Division Wine Co.
To all who participated in this book, I raise my glass of wine and toast you and all the hard work necessary to make this gem of cookbook a reality. Cheers!